Farms are really common in some states in America so you will have a tough time competing with such a large market in this farm game. You should do fine though, if you manage to follow the instructions and take really good care of your animals. Each level you will need to reach some goals, like collecting a few eggs from your turkeys, buying more animals, sending products in the city to sell them and so on. If you manage to buy some machines, they will certainly be a good addition to your farm, as they will turn ordinary items from your animals into finished products, so you can sell them for nice gold in the city. Use your warehouse to store items, or put them in your truck and send them away. Grow grass so your turkeys can feed on it and always fill your well up with water to keep it fresh. 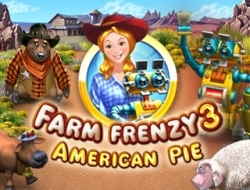 Farm Frenzy 3 American Pie 0.00 between 0 and 10 based on 0 votes.